President Donald Trump announced on Tuesday that US Ambassador to the United Nations Nikki Haley has resigned, and will be leaving her position by the end of the year. Appearing together in the Oval Office, Trump praised Haley as a “fantastic person” who has “done an incredible job” and said he would gladly welcome her back into his administration down the line. The President said that Haley had informed him about six months ago that at the end of a two-year period on the job, she’d want to take a break, but the announcement caught many White House officials by surprise. 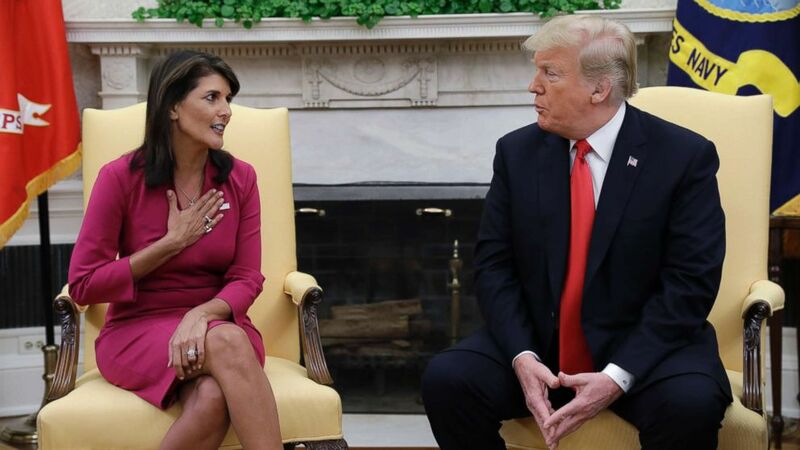 Haley said she was leaving because she needed to take time out after an intense six years as governor of South Carolina, directly followed by two years at the U.N. President Trump has a working list of contenders to succeed Haley, according to senior White House officials. The President said he plans to name a successor for the US’s top diplomatic post at the United Nations in two to three weeks. Among the names floated as possible replacements for Haley are: Trump’s former deputy national security adviser Dina Powell, US Ambassador to Germany Richard Grenell and senior adviser and daughter of the President, Ivanka Trump.